The multicore revolution has reached the deployment stage in embedded systems ranging from small ultramobile devices to large telecommunication servers. The transition from single to multicore processors, motivated by the need to increase performance while conserving power, has placed great responsibility on the shoulders of software engineers. In this new embedded multicore era, the toughest task is the development of code to support more sophisticated systems. This book provides embedded engineers with solid grounding in the skills required to develop software targeting multicore processors. Within the text, the author undertakes an in-depth exploration of performance analysis, and a close-up look at the tools of the trade. Both general multicore design principles and processor-specific optimization techniques are revealed. 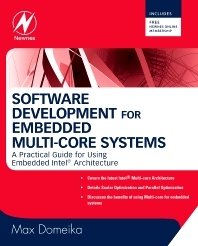 Detailed coverage of critical issues for multicore employment within embedded systems is provided, including the Threading Development Cycle, with discussions of analysis, design, development, debugging, and performance tuning of threaded applications. Software development techniques engendering optimal mobility and energy efficiency are highlighted through multiple case studies, which provide practical “how-to” advice on implementing the latest multicore processors. Finally, future trends are discussed, including terascale, speculative multithreading, transactional memory, interconnects, and the software-specific implications of these looming architectural developments. Software Burden or Opportunity What is Embedded? Senior Software Engineer, Intel Corp.